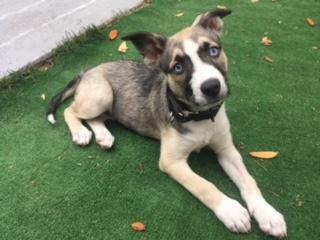 Willow is a 10 week old Husky/GSD mix. Her adoption fee will be $700. It will include shots through through rabies at 4 months at our clinic. She is super smart and trainable. She will already sit for treats and walks rather well on a leash. She has focus and drive. With the proper training she will be a superstar. At this time we are working on crate training and housebreaking, she is picking up both quickly. She is also visiting many people of all ages. And hanging out with two large huskies. Please contact me if you wish to make Willow a part of your life. She is a spayed Female, 11 months old, Crate Trained, Lead Trained, has Obedience training, good with Large Dogs, has DHLPP vaccinations, microchipped.